There is something truly magical about walking on the garden path along the Cherry Blossom on a sunlit morning in Washington DC, savouring the beauty of Lincoln and Jefferson Memorial. On one such walk I just suddenly turned back on an impulse – it was a cloudy morning to start with and then Sun came out in a radiant flash – and then I was equally spellbound to see DC from a whole new angle – White House and Washington Memorial standing tall across a whole range of park land. Close to Arlington National Cemetery and home to two of the greatest national monuments – that of Ab Lincoln and Thomas Jefferson – this is something like a national pilgrimage site for every American. 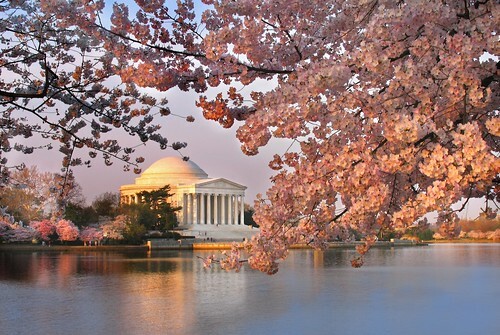 Cherry Blossoms are in full bloom there this April for the 99th Year. These trees were gifted by the then Mayor of Tokyo as a mark of friendship. At that precise moment when I turned back to discover the new vista of the maddening capital of the World’s most powerful state, I realized how Cherry Blossoms provide a true analogy of life for the Japanese. April is the time for Sakura in Japan – the festival of formally watching Cherry flowers in full bloom. But this year it is quite different – a massive earthquake rocked the Island nation just a month back, followed by a devastating tsunami. More than 25000 people perished in the twin disaster. Not only the scale of devastation stunned the nation but for the first time there was a serious threat of a nuclear meltdown, which alarmed the whole world. 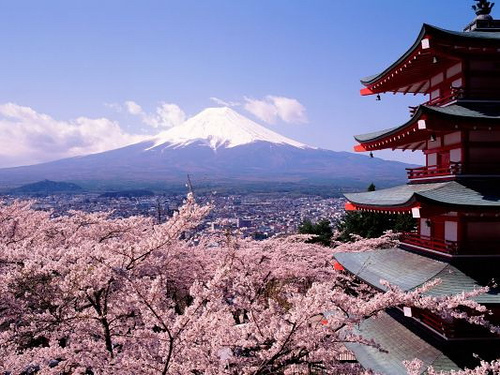 As Japan struggles to recover from the shock of it, no one is celebrating Sakura this year. Cherry flowers have been a unique symbol of rejuvenation for the Japanese for hundreds of years. All of a sudden bare Cherry trees transform into one of the prettiest sights of nature with beautiful Cherry flowers in full bloom. Cherry flowers thus provide a Japanese way of celebrating ephemeral life and its transient beauties. Japanese Civilization is unique in many ways – even in the midst of Tokyo’s sprawling urban life you will find little islands of tranquility - old gardens with a small waterfall – just like their culture of effortless blending of ultra-modern with the traditional. Even in the face of this great tragedy, there was hardly any display of public emotion. If you have ever been to Japan, I am sure you would not be surprised to read those emails being circulated about public discipline and community efforts. The level of technical perfection (along with discipline) they have reached in their day-to-day life is something amazing. This is for the first time in the wake of a meltdown threat at Fukushima Power Plant that the World has raised questions about Japanese technological prowess. But still Japan remains miles ahead of others in terms of technological progress. Perhaps the best example of it for a tourist is the railway network in Greater Tokyo, which displays train arrival and departure timings in terms of Hour:Minute:Second! Last October in Tokyo, I asked quite a few people whether they remember a train cancellation or running late in the recent past – all of them were more than surprised and did not have any answer for such a silly question. What is also equally amazing is their courtesy and extra-ordinary politeness – something they extend to every human being regardless of social or economic status and even to a complete stranger reaching across language divides. Japanese economy remains in a state of deflation for more than two decades now – one of the prime reasons for that is lack of innovations in a country, which is the birthplace of most of today’s industrial giants. Why Japan remains stuck in such a limbo could be perhaps explained to some extent by their unique social psychology. Despite their obvious technological advancement and other skills, their social mores remain baffling. Most of the Japanese would struggle to hug and say something as simple as ‘I Love You’ to their partners but would stick to one firm throughout their working life and would carry a profound sense of attachment to seniors, family, institutions and community. Japan also has one of the highest suicide rates in the world – people are often affected by a deep sense of guilt for their perceived failures. Against this backdrop, Cherry Blossom watching or tea-ceremonies provide formal occasions to celebrate nature and beauty. Cherry Season is also the time when a large number of foreign travellers visit Japan – this year most of them would stay away. At times you need to a shock to shake things up – as Japan tries to cope up with their worst disaster since the Second World War, one can only hope that the recovery would take them beyond the material repair and rejuvenate the soul of this ancient civilization – much like the transformation of Cherry trees in April.